I’m beginning this missive from a small room in a monastery on the outskirts of Canberra. Yes, I’m in the nation’s capital today and tomorrow, accompanying Mother Agnes as she appeals to Australian political leaders not to fuel the fire in Syria. I don’t know how closely you’ve been following developments in Syria over the last few days and weeks but things are certainly hotting up! The Syrian Army won a major victory at al-Qusayr. The Assad government thus seems to be winning the war. The US has therefore decided to channel more weapons to the rebels! This is the long and short of it, though the US is not admitting that they are acting out of a desire to see their side win. Rather, US officials are saying that the evidence for Syrian Weapons of Mass Destruction all of a sudden looks a lot more credible! In other words, Obama’s decision to give military support to the ‘Free Syrian Army’ (FSA) is a choice for World War III! Iran, Syria and Lebanon will therefore have to declare war on the US and Israel and whoever joins them. The rest of the world will inevitably get drawn in to what will become a battle between East and West – Muslim vs. Christian. 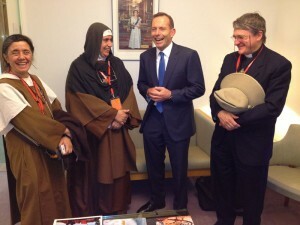 Anyway, for all of the above reasons I am down in Canberra with Mother Agnes and we’re chatting cordially with political heavies from all sides of politics. From here we head back to Sydney and have a big fundraiser dinner. If you haven’t heard the details about that, you can download the flyer here. On Sunday (June 23) we’ll be having Mother Agnes join us for prayer and worship at Holy Trinity and we’d love to have you join us. One serendipitous moment yesterday happened when I was slumped on a bench in the foyer of Parliament House. I was only half-awake when someone approached me and thrust out his hand, saying “Kevin“. 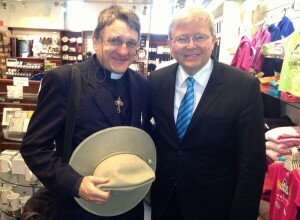 It was former Aussie PM, Kevin Rudd! I want to thank everybody for their suggestions regarding which of the three domain names I should use to set up my new Syria site (www.syria.net.co, www.newsinsyria.com or www.syriaupdate.com). For better or worse, I decided to drop all three domain names and go for one that targeted the religious community – www.prayersforsyria.com. US Republican Senator Ron Paul’s video appeal to American citizens to oppose Barack Obama’s decision to arm the Free Syrian Army. Of course, the fact that I have chosen a different domain name from the three I originally purchased means that the others are available for anyone who wants to build their own Syria website. Just go to ZeroCostWebsite.net, sort out a hosting package and get back to me. I’ll be happy to contribute one of the above-mentioned domain names if you can put it to good use. The other big news for us at Fighting Fathers Ministries at the moment is that we are losing our beloved caretaker family from Binacrombi Bush Camp. Geoff and Laura and the boys will be relocating to New Zealand at the end of July, and while we wish them well in their new life, Binacrombi will be mourning their loss. My plan, for the short term at least, is to try and run Binacrombi without a full-time caretaker family on site. Instead I am hoping that we can have teams of people go down on weekends and open up the place for our clients. Let me know if you’re interested in being a part of a team. The pay will not be huge but if you’re looking for challenge and adventure, this is the place to find it! A first aid certificate and a basic level of mechanical expertise is requisite for anybody who would like to lead one of the teams. It is a month for sad farewells. Last week we also had to say goodbye to our beloved webmaster, Fighting Father Jim. Jim is relocating to Melbourne with his partner, Kiko, from where he will be continuing his creative work. He wish him every blessing and strength for the future. The other sad farewell we have made this week is to the shell of our beloved Youth Centre – now bulldozed to the ground with so many memories buried beneath it! Rather than show you scenes of the demolition, let me instead offer you this picture of students from Petersham Public School, gathered on the street in front of our old hall. 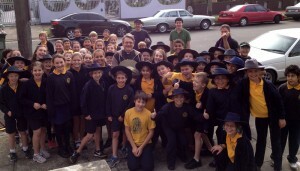 Petersham Public raised over $500 towards our reconstruction through a cake stall. For those who don’t know what ‘popping‘ is, it’s a type of rap dancing, and ‘Popping Jack’ was using our church hall to teach a lot of our local young people to ‘pop’ before the fire. I’m thinking we should have a dedicated popping room when we eventually rebuild. Let me conclude today with Fighting Father Denning‘s teaser clip of his upcoming documentary on our trip to Syria. ‘Mussalaha‘ (for those who might have forgotten) means ‘reconciliation’ in Arabic, and our trip to Syria was as a part of a Mussalaha delegation. 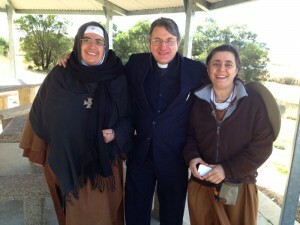 Please pray for mussalaha for Syria and pray for the work of Mother Agnes. And please join us at Holy Trinity this Sunday if you’re in the area. I’m hoping that we’ll have many members of the Syrian community come along to meet Mother Agnes and that it will be a truly multicultural worship experience. We start at 9.15am (or shortly thereafter ). It’s Father Dave back with you – a little worn and weary after our explosive Boot Camp weekend at Binacrombi – but feeling very much alive! It was a magnificent experience! All added up to a weekend that everybody who participated deeply appreciated. And it wasn’t just us hardened pugs who benefited. We had about a dozen children, including a number of pre-schoolers. Indeed, I was planning on sharing one of my favourite snaps from the weekend which pictured three of our young girls proudly showing off the ‘fairy castle’ that they’d constructed for their dolls out of stones on the property! Unfortunately that pic is on Ange’s phone which she seems to have misplaced, so you’ll have to wait until she recovers her phone before you can see that exciting image. 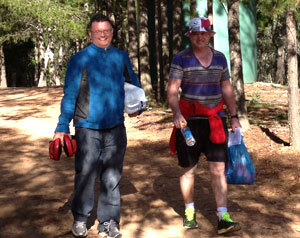 Below is our Boot Camp leader, Mick Richards (right) with Fighting Father Mungo. Mick is one of the most professional trainers I’ve ever met and is certainly the least pretentious! We didn’t see a lot of Mick strolling about and looking relaxed like that. He was normally standing over us with a stop-watch or throwing a medicine ball at us! 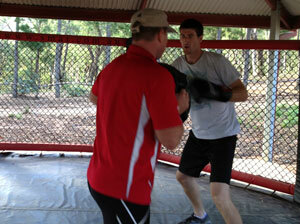 Below is a pic of Mick with big Trent in the Binacrombi Wrestling Cage, doing an intensive punching and fitness workout! Session 1 was a 45-minute intensive workout on the punching bags and weights equipment. Session 2 was a one-hour run across Binacrombi’s hills and valleys in the heat of the day. We then broke for lunch (exhausted). Session three was 45 minutes of hill running, where we had to do our best to sprint 250 meters up a steep hill, jog back down, and then do some intensive upper-body exercises before shooting straight up the hill again. I don’t remember 45 minutes every lasting so long! The last session involved one-on-one work with Mick in the wrestling cage, alternating with sparring in the boxing ring. This lasted until everybody collapsed in a screaming heap and then gradually crawled back to the dining room for some sustenance. My account probably isn’t enthusing anybody to join us for the next camp but, in truth, everybody who came enjoyed it so much that they determined to bring friends next time! Mick said at the beginning that his job was to help us each ‘find our engines’ and, in truth, we all found them! One of the personal highlights for me was having Dimitri Patsouris as my guest on the camp. I made my professional boxing debut with Dimitri (then ‘Jimmy Pat‘) back in 1996! What is so special about this is that Dimitri didn’t have a lot of love for me at the time of our fight in ’96. Indeed, he didn’t want to shake my hand after the fight! But since that time Dimitri has become a man of faith and has developed into an enormously big-hearted human being! 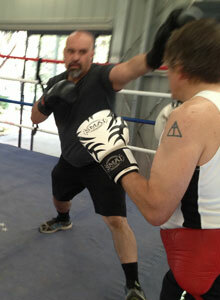 The weekend climaxed for me with doing three rounds with Dimitri, who hasn’t lost any of his skills. The disheartening factor for me was that he’s now more than 30 kilograms heavier than me, and packs one helluva right hand! I wish I’d taken some group shots of all of us together. Unfortunately I was in the middle of it all the whole time, so didn’t really get a chance! Fighting Father Denning though had an injured foot and spent a lot of time videoing the weekend. He should have a watchable version for us real soon! In the meantime, here’s a pic of our boy, Sol Egberime, sparring with one of the hardest workers on the weekend – Nadine, whom I believe was German women’s welterweight champion. Our next Boot Camp is scheduled for May 10th to 12th. Let me know ASAP if you’d like to join us! I can pretty much guarantee that we can help you find your engine! There’s no sermon video this week as I wasn’t preaching. We did have a wonderful time of prayer and worship at the Boot Camp, with Fighting Fathers Caine and Geoff doing the leading and preaching, respectively, and me presiding at the Eucharist. Even so, there’s no video. What I do have for you this week is a new website that Fighting Father Jim and I have been working on for a while. It’s not fully completed yet but it’s in the BETA testing phase. In other words, it’s good enough for me to show to my mates – that is, YOU! The purpose of the site is pretty straightforward. We’re trying to build zero-cost websites for good people like yourself and we’re hoping that it’s going to be productive and viable. We need your feedback though before we go any further. Could you do me a favour please and check out zerocostwebsite.net? The offer of the free site on there is genuine and if you’d like to sign up for one you can. Either way, could you please also check out my alternative homepage for the site which you’ll find here. When you compare the two pages you’ll see that one uses full-screen video and one uses a normal framed video. I personally like the full-screen version as I feel it helps me to relate to the viewer better. Jim finds the full-screen version intimidating and thinks it will turn people away. What do you think? Both Jim and I would sincerely value your opinion. OK, it’s time for me to get some sleep, fighter. I’ll see you next week! P.S. Last week I mentioned the death of my dear friend, Grace Reppion. 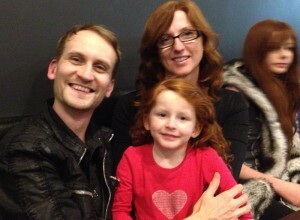 If you’d like to join us for the funeral, we’ll begin at Holy Trinity Dulwich Hill this Wednesday morning at 10am.